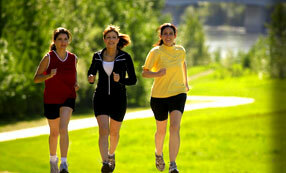 The popularity of walking as a fitness activity is growing by leaps and bounds. Low risk and easy to start, walking has proved its health benefits in numerous studies. A classic eight-year study of 13,000 people conducted at the Institute for Aerobics Research under the direction of Dr. Steven Blair found that those who walked the equivalent of 30 minutes a day had a significantly lower risk of premature death than those who rarely exercised. A walking program is simple to start. All you need are comfortable clothes and shoes. It is a good idea to layer loose clothing, keeping in mind that exercise elevates the body's temperature. Shoes specifically designed for walking are your best option. Every workout should begin with a brief warm-up and a few simple stretches. Walk around the house or in place for a few minutes to get the blood flowing to the muscles before you attempt to stretch them. Although walking primarily works the major muscles of the legs, don't forget to stretch your back, shoulders and arms. This will help to loosen up any tension you may be carrying and make your walk more enjoyable, as well as more effective. Walk short distances-Begin with a five-minute stroll and gradually increase your distance. Forget about speed-Walk at a comfortable pace. Focus on good posture, keeping your head lifted and shoulders relaxed. Swing your arms naturally-Breathe deeply. If you can't catch your breath, slow down or avoid hills. Be sure that you can talk while walking-If you can't converse, you are walking too fast. Walking is one fitness activity that allows you numerous options. Once you have reached a point where you can walk a few miles with relative ease, you can start to vary the intensity. Walking hills, in addition to increasing your cardiovascular endurance, is a great way to tone the legs. Concentrate on lengthening your stride or increasing your speed. And don't forget to reward yourself after each workout with a few minutes of relaxing stretches to help prevent sore muscles. Listening to lively music while you walk is also a great way to energize your workout. But if you wear headphones, keep the volume down and watch out for traffic that you may not hear. Keep track of your progress. Many experts recommend that you walk a minimum of 30 minutes a day, but there are no hard and fast rules. Fit walking into your schedule whenever you can. That may mean three 10-minute walks each day, or even hour-long walks two to three times a week. The best schedule is one that keeps you walking and keeps you fit!